The other day I read his first post where he talks about the tiki-transformation of his basement bar where he have installed a freakin`VOLCANO! 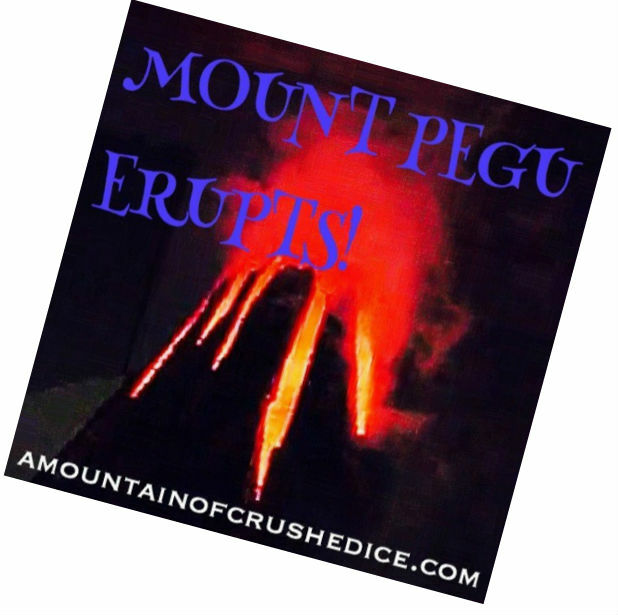 it erupts too….you can see it here in this video, I think this volcano is brilliant! and he built it himself. That`s pretty freakin`cool isn`t it? So since we are in the tiki month that requires me to post up something…and I have a drink that seems to keep living on despite it was back in 2009 I made it for the Mixoloseum TDN (Thursday Drink Night) when the theme was Zombie, so I posted it and then forgot about it, until years later I heard it was served at the former PKNY in New York. Then a couple years after that it was found in the book the “Zombie Horde” by the Professor Cocktail (David J Montgomery) a whole book dedicated ONLY to the Zombie drink with no less than 86 different Zombie and Zombie style recipes included, spanning from Don the Beachcombers 1934 Zombie Punch and over the years to more modern takes in 2013. This is obviously a drink you can have fun and tinker with a lot! 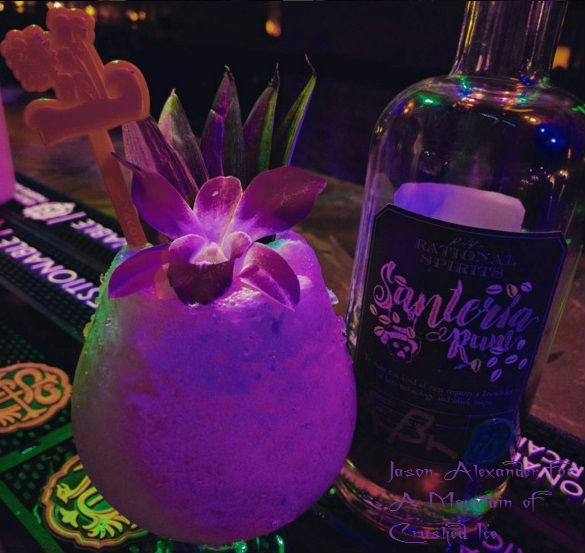 it`s not a traditional Zombie per se, not really, because ther isn`t much it has in common with say the 1934 Zombie Punch but it´s more a “Zombie-like” drink and the name “Guyana Zombie” due to the demerara rum content has stuck with it. The 2016 version is made by none other than Tacoma Cabanas tiki master and fire wizard, Jason Alexander and he has invented a fantastic thing called “Spiced Coconut Honey” which is crazy good! 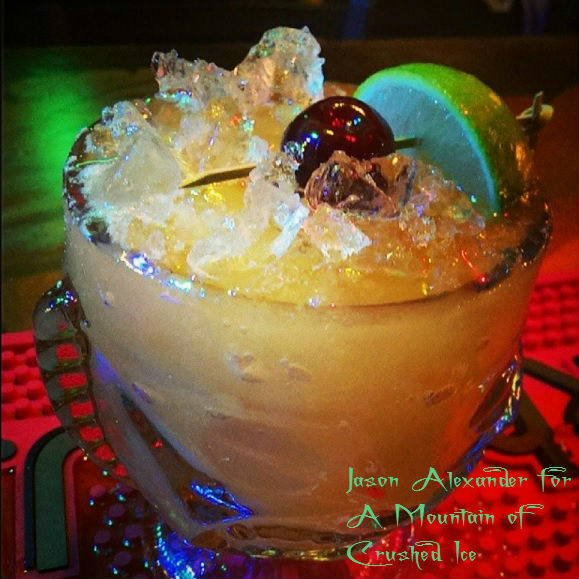 so what i`m gonna do for this tiki month is posting up these drinks including pics of Jason`s earlier takes on this drink which he made at the Tacoma because I think they look beautiful. 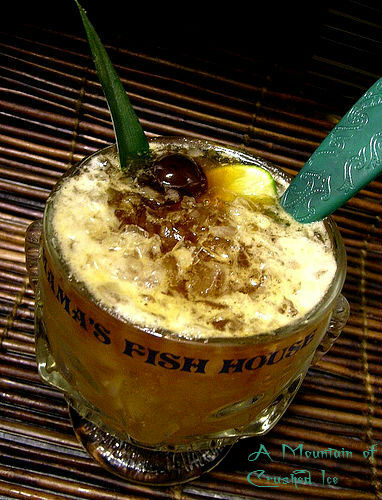 Serve in goblet or other glass (or tiki mug) with crushed ice. Blend with crushed ice at high speed for 5 sek. Pour into goblet with more crushed ice. Garnish with a little pinch of sprinkled demerara sugar, lime wedge and brandied cherry. Blend at high speed 5 sek or shake with ice, Pour into a snifter or fancy tiki glass or mug. It´s a very tasty drink, no doubt! I also made a version of this with banana syrup switching the flavor focus from coconut to banana. It turned out great! coconut, banana and pineapple they go very well together…. 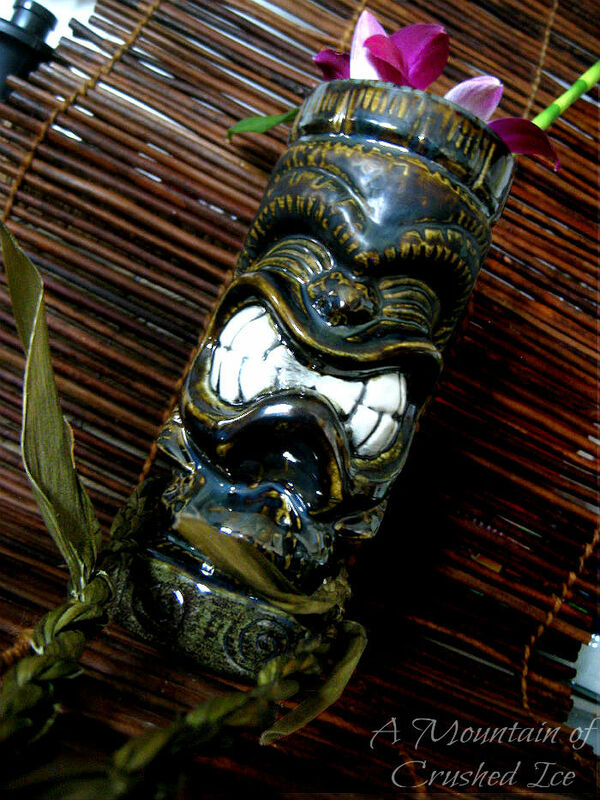 Served in one of Wim Thieleman`s fantastic tiki mugs the Marquesan Coconut! Shake all ingredients with ice and strain into a glass or tiki mug filled with crushed ice and garnsih with a piece of pineapple and tropical orchid. 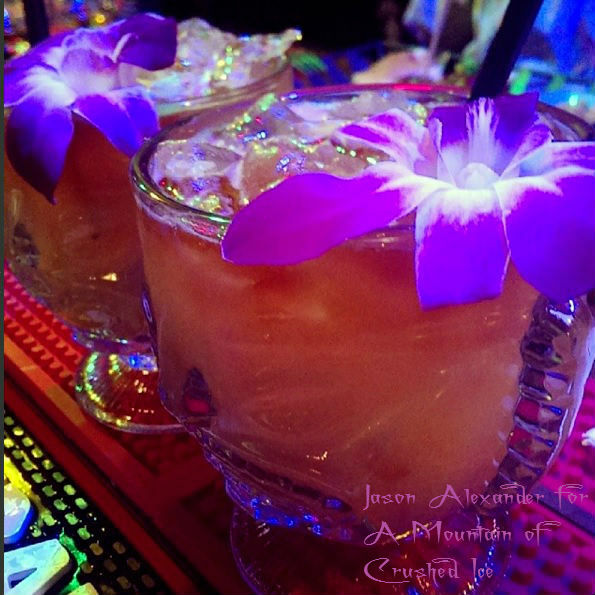 And here is two of Jason`s takes on the original Guyana Zombie, made at Tacoma where this drink was very appreciated and no wonder when not only does it taste good, he makes them so pretty! 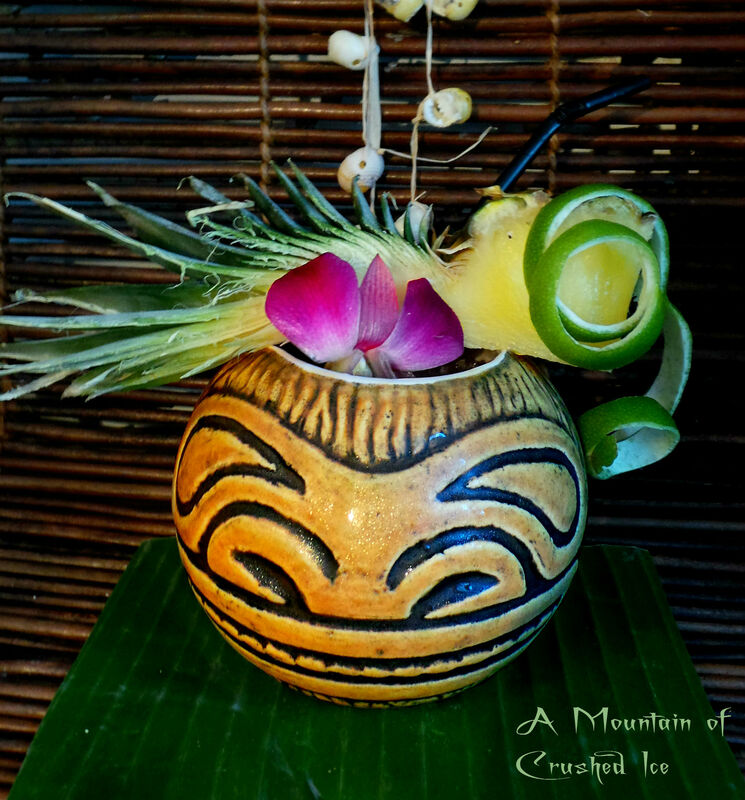 Shake with ice and strain into a tiki glass – and you may set it on fire too! And finally…I made a version of the Colada Noir but using banana syrup because I wanted to see how it tasted, i`m in love with banana syrup! 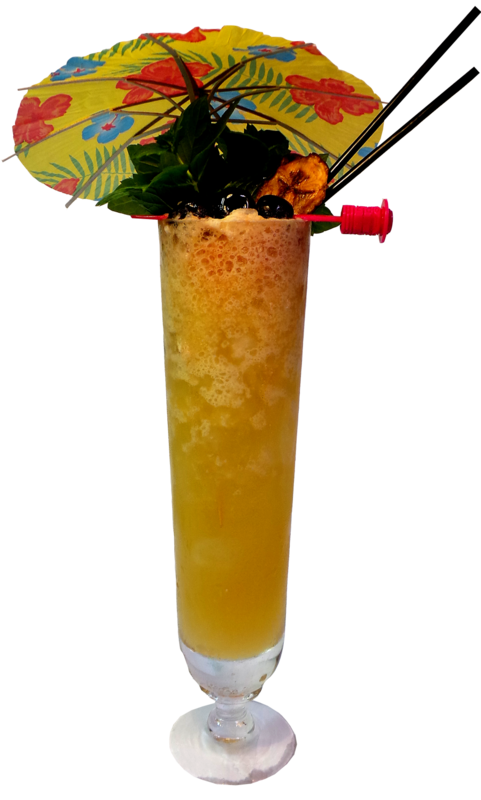 I nowadays find myself “bananaize” a lot of drinks…good drinks to use banana syrup in are the Coladas, Boo Loo, Coconauts and drinks with citrus and tropical fruit juices as well as tiki drinks containing coffee which I shall post about soon. 0.5 oz strong Kona coffee (or Blue Mountain (Jamaica) or Community Coffee (New Orleans) brewed then cooled. Blend in blender at high speed 5 sec with 1 cup crushed ice and pour into a snifter. 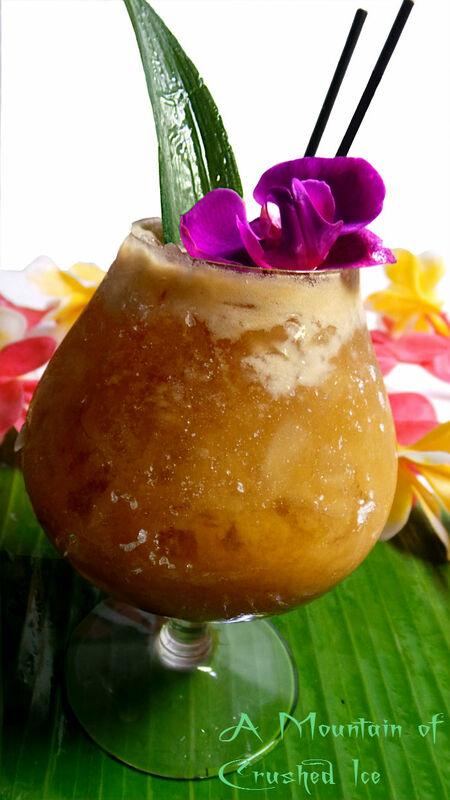 Fill up with more crushed ice if needed and garnish with a pineapple leaf and tropical orchid. You can shake it too of course, but it gets more froothy with a blender. 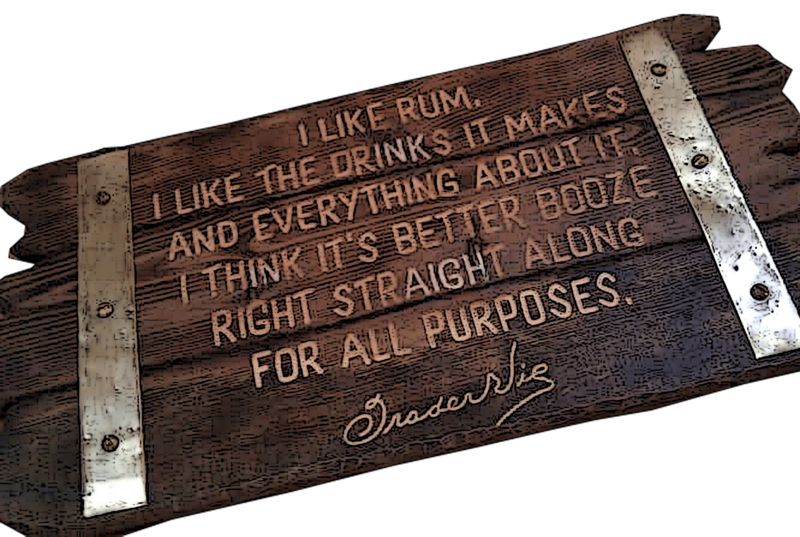 Disclaimer – I may be the brand ambassador for Rational Spirits but this specific post is a post for the Tiki month as A Mountain of Crushed Ice. So here we go again with the next tiki drink challenge, the one and only, the Zombie! oh how I love that drink! 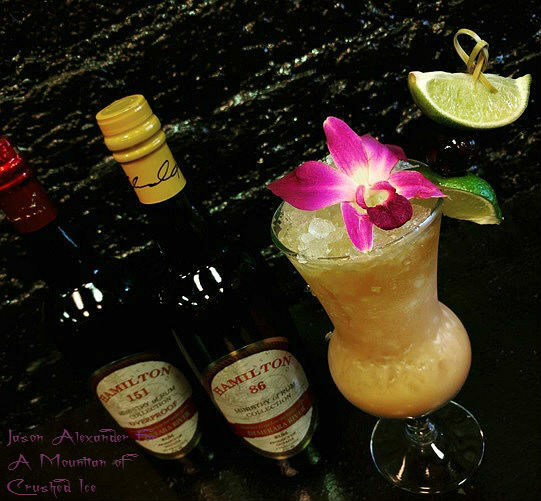 and not only does it taste fabulous, it was this very drink that started the tiki craze and put Don the Beachcomber on the map! 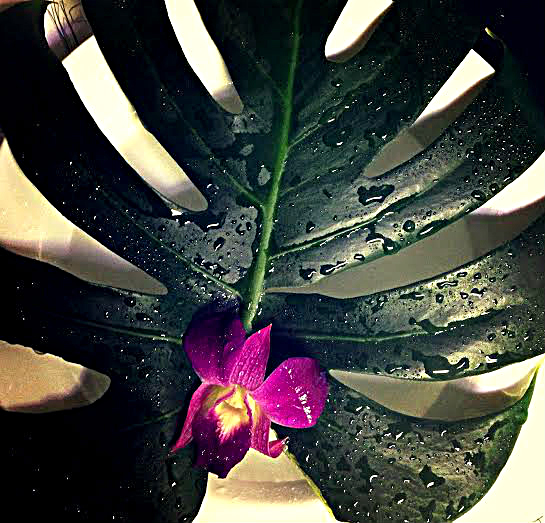 But tiki is so much more than just the drinks – which are just one piece of the puzzle that makes up the colorful and exotic “Tiki fabric” – but a very important one! and the Zombie is one of the most important of the drinks. 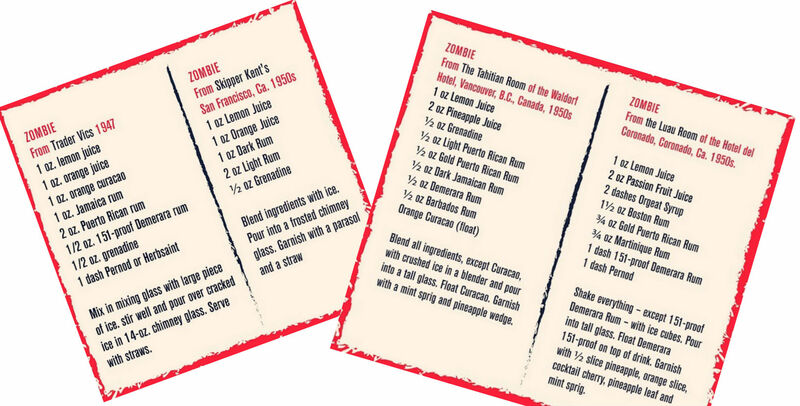 The Zombie is so popular that there´s even a whole book dedicated to just the Zombie, it´s history and what must be the worlds biggest collection of Zombie recipes! and in Sippin`Safari there`s a whole chapter about it´s history and how the Bum cracked the code. Because the original recipe was written in code. 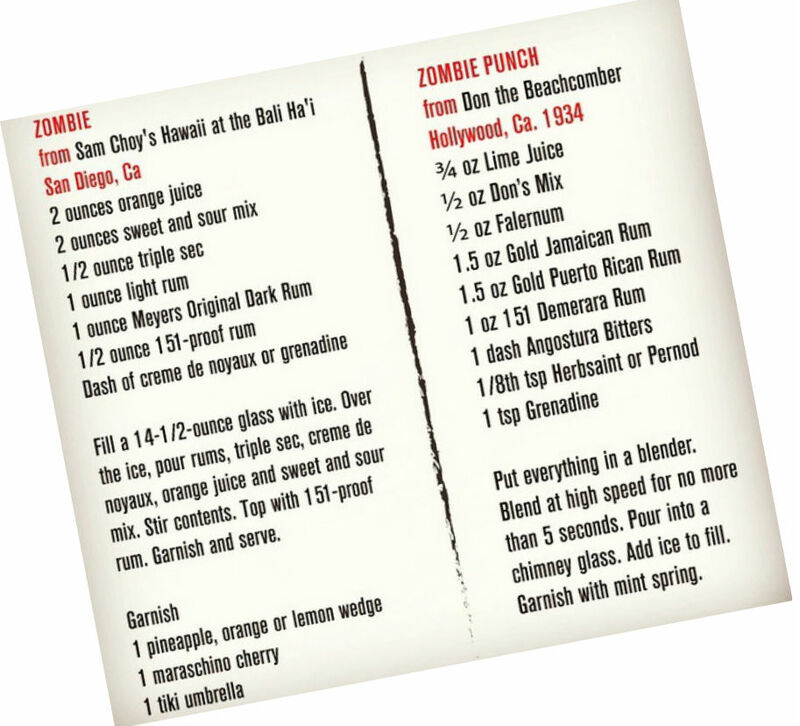 There´s tons of Zombie recipes out there, some good, some worse….but the best in my opinion is the original, the 1934 Zombie Punch by Donn Beach, which btw he kept tinkering with his whole life. 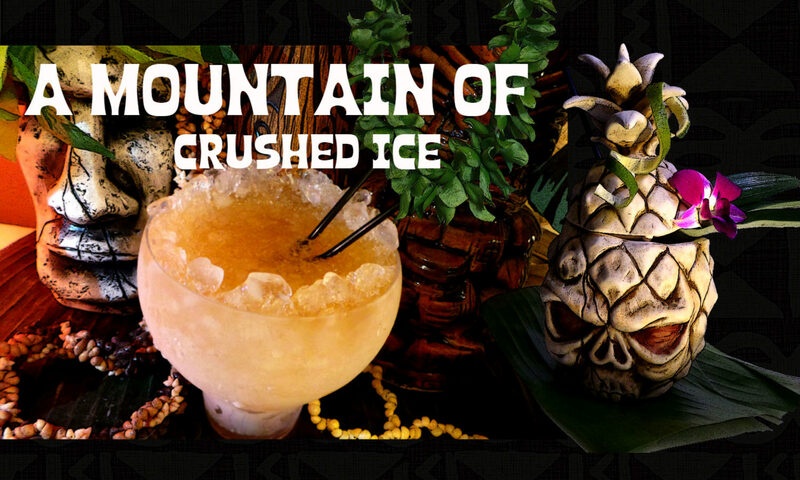 If you don`t know already, the Tiki drink challenges are taking place on Instagram where you post up a picture of the drink in question whether you make your own or order one at a bar! and feel free to play around! you can find all the submitted Zombies on the hashtag #zombiechallenge2015 and make sure to follow @el_nova_1 for updates. Shake everything except the 151 demerara with ice cubes and pour into tall glass. Float 151 demerara on top and garnish with 1/2 slice pineapple, orange slice, cocktail cherry, pineapple leaf and mint. Let the Zombie take over….. Saving my favorite Zombie recipe for last, the 1934 Zombie Punch by Don the Beachcomber, it´s originally served in a chimney glass but since I used that for the first drink I decided to use one of the cool mugs I have that are made by Wild Thing Creations. Now, the 1934 Zombie Punch…..this IS a drink!